The primary key data field selected in the previous dialog is shown in this field. 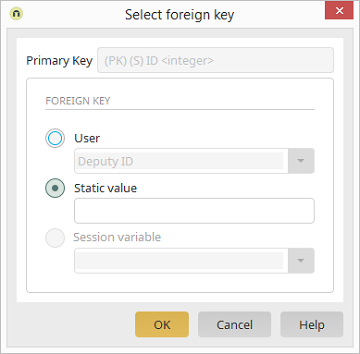 Here, a field from the User Manager can be selected as the foreign key. A specific, static value that should be used as the foreign key can be entered here. The value from a selected session variable is used as the foreign key. is not possible. Certain conditions apply to references to external data groups: If the external data group originates in the Intrexx system database - the standard connection "SysDB" -, creating references is usually possible but only if the external data group is a physical data group. If the external data group does not relate to the Intrexx system database, then the reference is not possible.